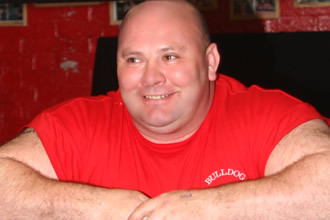 Genesis Gym has been owned by World Champion Powerlifter Dave "Bulldog" Beattie for the last 14 years. Dave's background in physical training started at the age of 13 when he begun comptetititve weight and power lifting, winning several junior titles. He then joined the Royal Marine Commandos where he served for 12 years taking part in various operations of the Falklands War. After leaving the marines, Dave moved to London and 6 years later opened Genesis Gym in Wembley. Dave is still competing in powerlifting and maintains his title as World Champion after winning four consectutive World titles and setting the World Record for the squat of 462.5 kg (that is 1020lb! )at the World Power Lifting Championship (WPC) in 2008 in Miami. Dave said, "I'm 51 years old and believe I can still get stronger". Dave has returned to competing in powerlifting in 2014. On the 10th August 2014 Dave won the best overall raw lifter at the GPC British Powerlifting Finals (Global Powerlifting Commettee Great Britain) and made the biggest raw squat in any federation, age or weight class in the United Kingdom. The squat was of 380kg and no supportive powerlifting equipment was being used during the lift. This remarkable squat puts Dave to be Number 1 in the World in the Masters Group. Dave has helped train The Rock and Jimmy Marku who won Britain's Strongest Man in 2008 and regularly helps coach Andy Bolton, the World's Premier Super Heavy Weight powerlifter. These athelets train with Dave in what is a "no attitude" friendly gym for everyone. Dave also has a strong powerlifting team, who have taken numerous titles. Dave is keen to promote the use of weights in many sports and coaches gymnasts, body builders, endurance athletes and professional boxers to better themselves through the use of weights and initiative ideas. Dave is keen to help anyone suceed including wheelchair and disabled athletes through to top International competitors in any sport. All Dave likes to see is commitment and the will to train hard and not complain. "I enjoy training anyone at any level as long as they are prepared to show commitment and enthusiasm."